and historical performances on the Parade Ground, and a concert by celebrated saxophonist and multi-instrumentalist Steve Wilson and his combo. 11 AM: A procession of African dancers and drummers, African-American heritage groups, and community representatives will proceed through the Main Gate to the Parade Grounds honoring the many enslaved people who walked through the fort’s gates on their path to freedom. 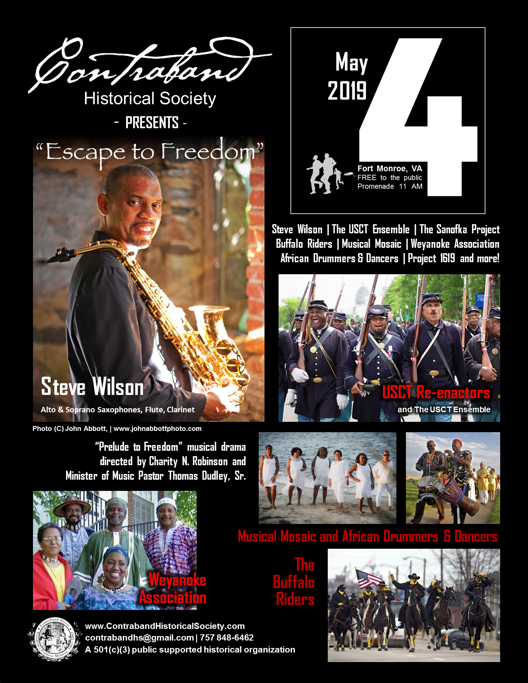 * Excerpts from “Prelude to Freedom,” musical drama by CHS founder, the late Gerri Hollins, directed by Charity N. Robinson and Minister of Music Pastor Thomas Dudley, Sr.
2 PM: Concert by Steve Wilson and band. Wilson is an acclaimed multi-instrumentalist, former member of the Smithsonian Jazz Orchestra, and performed with Lionel Hampton and Chick Corea, among others.